My last blog about counting test cases generated a lot of discussion, not just in the comments for my blog, but on other sites and in emails with other testers. Some of this discussion spilled over into a more general discussion about reporting on test plans and progress. At the time of the projects I described I was hostile to the idea of counting test cases simply because they weren’t relevant to those projects. I had no theoretical, philosophical problem with them. If they had been a useful way to plan, structure and report on the testing then I’d have happily gone down that route. I’m now far more sceptical about whether it would ever be useful to turn such a vague, varied concept as a “test case” into something that would serve as a useful basis for structuring the testing. Using test cases as if they were some sort of building block should certainly not be the default option for a test manager, as I used to think. What matters is what works. We should use what is useful, and that varies depending on the nature of the problem. Rigid standards or processes can be a problem if they command a particular approach without regard for the context. However, often we impose restrictions on ourselves without realising it. We assume we have to do something a certain way. If you analyse our actions and motives we sometimes do things because that’s the way we always do them, or we’ve got a tool and we just use it without questioning its relevance. This is a particular problem with our communications. Metrics, reporting, and planning work breakdown structures are usually seen as being primarily about management. They are also a form of communication. That should be a statement of the glaringly obvious, but it’s something we often neglect. If we have to get a message across there are three things to worry about; the message, the audience and the medium (or channel) we’re going to use. They’re inter-related, and the way it should work is that the message and the audience dictate the medium. Obviously there are constraints. If you work in TV or for a newspaper then the medium’s a given, but the general point still holds. The way you communicate depends on the audience and the message. Unfortunately, we tend to forget that the audience and the message are the starting point. We go straight to our default choice. We grab PowerPoint if we’re going to be up on our feet addressing the audience. We use the same old set of reports and metrics that have been used on every other project. These tools shape the message. The audience just gets dumped on. They get whatever message fits the medium. We fall back on “tried and trusted” tools and techniques. We don’t stop to think and realise that they’ve been tried and frequently found wanting, but we trust them anyway. What’s the reason? Intellectual laziness? A yearning to stay in our comfort zone? Inertia? Fear of being seen to try something new? I don’t know. Sometimes it seems that the objective is to do the communication task, to tick off the task on the Gantt chart, not to get a message over. PowerPoint is a glaring example of this deeper problem. There are specific problems with the tool that should make us think more carefully about all the forms of communication that we use. If you start off with the medium you usually commit two basic sins. Firstly, you tailor, and possibly distort, the message to suit the medium. My church recently launched a service advising people on how to budget their finances. We invited key people in the community to come to meet us and hear what we were doing. There are five of us in the team and we expected about 12 to 15 people. I didn’t think a PowerPoint presentation was appropriate. I thought it would be better if we took it in turn to say a few words each and then spend most of the meeting just talking to our guests. We’d help them to get to know and trust us so that they’d feel comfortable referring people to us. We held a meeting to plan the launch. Someone had brought a PowerPoint presentation along as a starting point to the discussion. The presentation was full of facts and bullet points. It wasn’t about us. We then spent ages refining the presentation, stripping it back till we had something we could use and that was a bit more like the informal session I’d intended. It took us twice as long because we were doing things back to front. Here’s the tool, this is the message, now who are the audience? I think we got to more or less the right destination, but only because I was being stubborn. We shouldn’t have been using PowerPoint at all. It was just a distraction. It’s easy to spend more time fiddling with the appearance of the slides than on the real message because we don’t want to appear sloppy or amateurish. The medium becomes more important than the message. After contorting the message to fit into the limitations of PowerPoint, we then go out to give our presentation – to the screen, with the audience somewhere behind our back. You ignore your audience because you’re staring at the screen and you tend to forget about the audience. They can just fit in with what you’re doing. That’s the second great sin. I’m not going to delve into psychology or theories of communication, but the transactional model of communication is interesting. This holds that communication consists of the message, and the feedback to the source. Communication is two way as illustrated by this diagram of the model from Wikipedia. 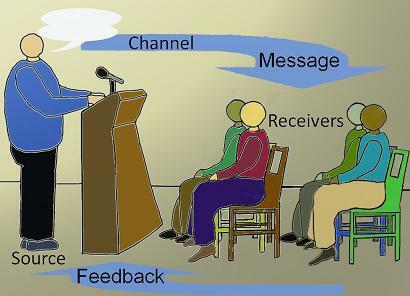 Note how the speaker is looking at the audience, and can pick up feedback. When I was at university, in the days of slides and overhead projectors, I had an interesting conversation with a lecturer, who explained why he never used notes in lectures. He might scribble some notes and references on the projector as he talked, but he never had a script. His reason was that he knew the subject intimately. Talking without notes forced him to slow down and think about what he was saying, so that he could pace the lecture to the speed with which the students seemed to be taking it in. If he used notes, he’d just gabble through the lecture exactly as he’d planned it in advance, regardless of the sea of blank, uncomprehending faces in front of him. In fact, he wouldn’t notice these faces. He’d be too busy with the script. I recently came across this wonderful piece that took that lecturer’s point to another level. Neuroscientist Professor Marian Diamond explains why she doesn’t use PowerPoint for her lectures. As an educator, and expert on how the brain works, Professor Diamond knows that PowerPoint is wrong for her and her students. If you are going to use PowerPoint, make sure you use it well and don’t cram into too many words and too many slides. Check out a classic article, “Death by PowerPoint”, by Angela Garber warning of the pitfalls of PowerPoint. Also, have a look at this short piece, which boils down to the maxim, use fewer words and more pictures. It’s from the same site where I picked up the gem from Professor Diamond. If you have to get a message across you need to really understand what that message is, and who your audience is. You need to analyse what you have to do, because initial assumptions or even direct instructions from above can be misleading. You need to understand for yourself just what you have to do, why you’re doing it, who you’re reaching, and the effect you want to have. This knowledge can sometimes be a bit dispiriting, e.g. if you realise that the reports and plans you’re producing are really not about helping you, or anyone else, manage the work. They may be simply about compliance with standards, or a defensive measure against auditors, or a mechanism to trigger release of payments to a supplier. Nevertheless, the knowledge of what is really going on helps you to manage the situation. You can challenge the assumptions, or offer a more effective and efficient way of reaching the same goals, or you can just ensure that your message is precisely shaped for the real targets. Senior management may be expecting you to count your test cases, and present impressive pie charts. However, they don’t really care about the number of test cases, any more than they really care whether you’re a wizard with PowerPoint. They need to know that you know where you are, and what you’re doing. Above all they need reassurance, so they can reassure the people on their backs. Give them what they need, and persuade them it’s not necessarily what they’re asking for. If that persuasion requires PowerPoint, then fine. But only if it’s really necessary. Really!